Earlier this month, I found myself in the Court House. No, not for any misdemeanors or felonious criminal offenses, but because I had received my very first jury duty summons. If you knew my age, the fact that it was the very first summons might surprise you. In fact, if you knew my age …. that might surprise you as well … but that’s another story. My first reaction was not one filled with patriotism and eagerness to fulfill my civic duty. That I will, shamefully, admit. No, it was more like ….. “holy crap, I so do not have time for this.” This is not something I am proud of, but I do believe in telling it like it is. After a few days of thinking about how men and women have fought for our freedom to have the right to a fair trial by one’s own peers, I came around. Ok, that, and the fact that it would give me something new to blog about. We walked several city blocks (the cost of free parking) and by the time we got there, we were fast friends. (And my hair was totally frizzed …ugh) We put our purses in the little baskets and walked through the line. I had one scary moment when the “inspector” took my purse out of the basket to hand to me and said “wow, this is really heavy, what do you have in there?” I responded, “You would be surprised.” … and then I had this vision of being knocked to the ground, told to spread eagle, and having my rights read to me. I mean … everyone is so sensitive these days. We finally found the floor and the room in which we would spend the next eight hours. Of course, no one thought we would be there that long; we were told later in the day that the process was taking longer than normal. Apparently, there were several courts in sessions on this day, and the process of a court session actually going to trial, the random selection of the jury pool, and then the actual selection of the jury for each trial … and alternates … took quite a bit of time. After it appeared that the last person who had been summoned had strolled in, a very gracious lady … Gwen … called us to attention and went around the room zapping the bar code on each person’s summon. She gave directions to the bathrooms, another jury room (smaller, with 2 computers and 1 gaming computer, and a T.V. that looked to be about 20 years old (everyone in the picture looked like they had been slimed), and the coffee area. And I do mean coffee … just coffee, as there was no creamer or sugar. The vendor had not delivered the creamer or sugar for that week, so far. Gwen then put on a video explaining the jury selection process, and what was expected of us as jurors. After that, we were left to our own devices … and required not to leave the floor without permission. I was extremely impressed with Gwen. She was very firm, and yet very respectful of each person and was, again, very gracious in her demeanor. Finally, Gwen called us to attention. It was time. Some of us were about to be called outside and told to form a line. As the names were called, I could see panic in some eyes and in some …. just blank stares. I don’t know why …. but, I instantly thought of the movie “Schindler’s List.” While those left behind looked through the glass partition, we could see someone giving them instructions … and then they were herded away. The concern for those whom had disappeared from the hallway dissipated as Gwen, once again, called for our attention. We were told we were free to go to lunch. And, this was truly the highlight of the day. Courtney and I went to one of my favorite places, downtown. Nico’s is an Italian Restaurant, serving fresh-baked bread and pastas. We spent an hour truly getting to know each other, and I hope that it is a friendship that will continue to grow. By 2:00 pm, we found ourselves back in the “waiting/jury room.” By 3:00 pm, it was apparent that the “natives” were getting restless. I noticed that some of the ones who had been pulled out of the jury pool for selection were coming back in the room. I considered this “proof of life” that there really is life after disappearing from the dreaded hallway. And then it happened. Just when I (and everyone else in the room, surely) thought that we would be told we were free to go home … Gwen called us to attention. It got so quiet you could hear a judge’s gavel 50 miles away. Gwen announced that yet another set of jurors and alternates were needed. I imagine we all held our breath with each name being called. Then I heard my friend Courtney’s name. Our eyes locked and I could see the terror in her eyes. She stood up and walked toward the hallway. She seemed to be moving in slow motion (you know like one of those great playbacks of Plaxico Burress catching Eli Manning’s touchdown pass in the last 35 seconds of the game to win Super Bowl XLII … only not as great.) I wondered if I would see my new-found friend again. It was after 4:30 pm when Courtney came back into the room. Like two old friends who hadn’t seen each other in years, I greeted her with a heartfelt welcome and a rush of questions. She had not been picked for jury duty and speculated as to why she hadn’t. That’s when Gwen, for what would be the last time that day, called us to attention to let us know that we were no longer needed (for a least two years) and we were free to go home. It is amazing how many people can sandwich themselves in an elevator in anticipation of being set free. Courtney and I casually walked back to the parking garage discussing the day, and all the things we had learned from the experience. We speculated on all the reasons one does not get picked by a jury, based on her experience in the courtroom, as well as others we had talked to during the day. We hugged and said our good-byes with promises of staying in touch. I truly hope she does. 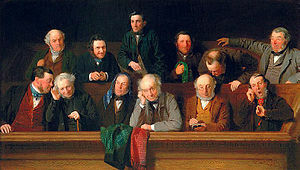 I learned that when the selected members of the jury pool went into the courtroom. Each one was called upon and asked (in front of everyone else) a series of questions from each side (prosecution and defense). And, something as simple as a specific work experience would excuse one from serving. I learned that we can be called back as often as every two years for jury selection. I learned that my eight-hour day earned me a $12.00 check. Had I served on a jury for four days, I would have received $20.00 per day. If I were to serve longer, starting with day 5, I would received $40.00 per day. But as far as the dollar amount is concerned. Serving on a jury really isn’t about me and what I can earn. It really is about doing my civic duty for a right that has been granted us … and that is a fair trial by one’s own peers. As far as my “valuable time” is concerned, that isn’t about me either, but the valuable time spent on jury listening and processing information that I would then take into a room and …. with 11 other jurors … make a decision that will forever change the lives of not only the person on trial, but the family and friends of that person. It very well could be the most valuable time someone has ever spent. And besides …. it will give me another piece to write about. Maybe an “Order In The Court-Part 2.) But again, seriously …. this isn’t really about me.